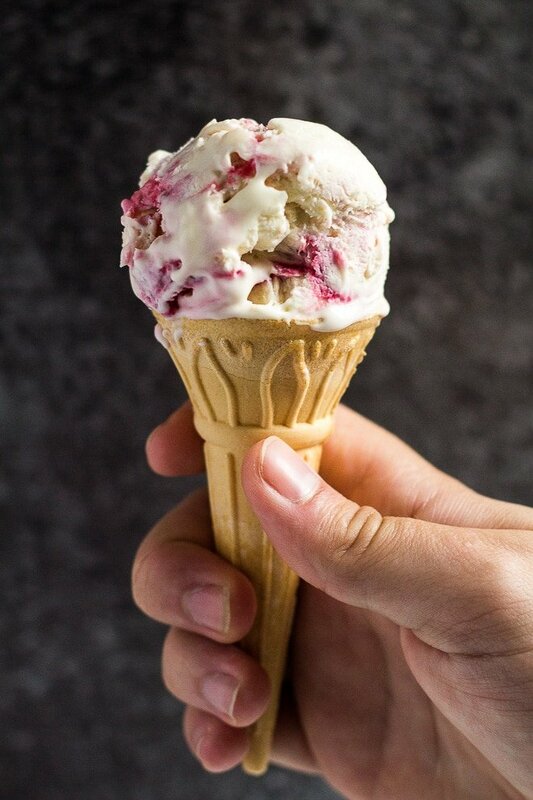 No-Churn Raspberry Ripple Ice Cream – A deliciously smooth and creamy no-churn ice cream rippled with raspberries, and is only 5 simple ingredients! 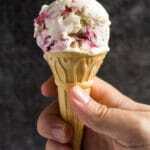 Raspberry Ripple ice cream is definitely one of my favourite flavours, alongside Mint Chocolate Chip of course. Today, I bring you a quick and simple, no-churn version which tastes absolutely delicious, my family couldn’t stop going back for more! This ice cream can be stored in the freezer for up to 1 month, but trust me, it won’t last that long! 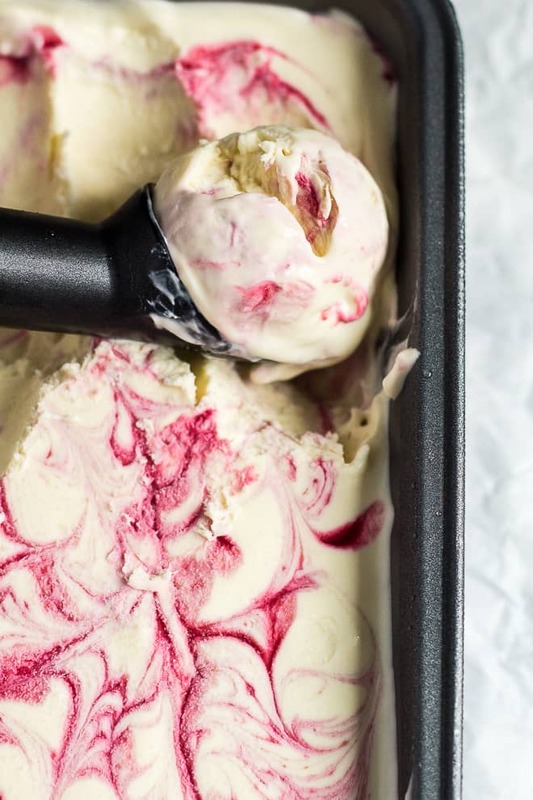 A deliciously smooth and creamy no-churn ice cream rippled with raspberries, and is only 5 simple ingredients! Place the raspberries and sugar into a saucepan over medium heat, and bring to the boil. Simmer for about 5 - 10 minutes, stirring occasionally, until the raspberries have broken down and the mixture has thickened. Push the mixture through a sieve into a small bowl, and discard the seeds and pulp. Allow to cool completely. In a separate bowl, whisk together the condensed milk, and vanilla. Gently fold in the whipped cream. Pour half of the mixture into a 9x5-inch loaf pan, and dollop spoonfuls of the raspberry sauce on top. Swirl the sauce through with a toothpick or knife. 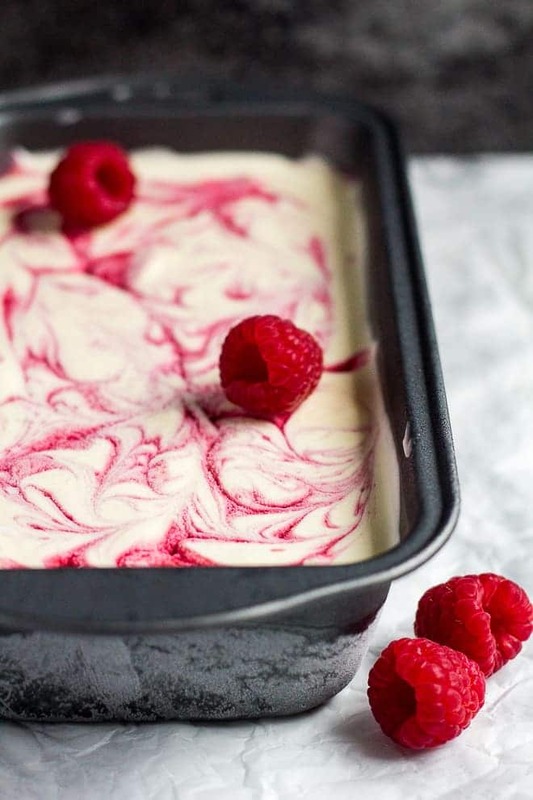 Pour on the rest of the ice cream mixture, and swirl in more raspberry sauce. Use as much or as little of the sauce as you want, or save some for another batch of ice cream! Cover tightly, and place in the freezer for at least 6 hours, or overnight before serving. 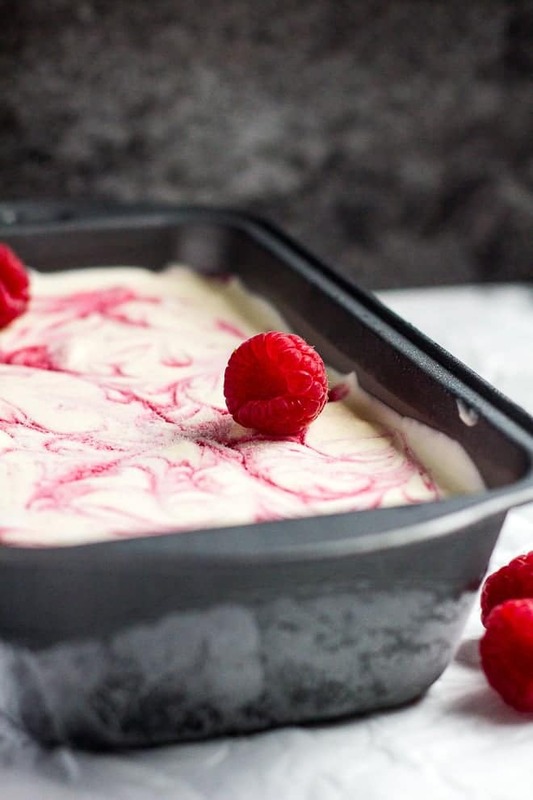 Raspberry sauce can be stored in the fridge for up to 1 week. WE have a persistent heat wave here and this is so good to find these days ! Thank you so much ! Good refreshing treat on these hot days in Nv. Whew! I prepared it last night so it would be frozen today after dinner. Cant wait to try. As a person who loves ice cream anyway.